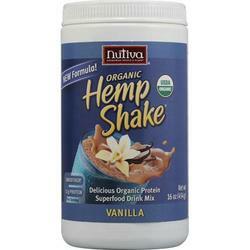 Save on Nutiva Hemp Vanilla Shake (1x16oz). Organic hemp protein, organic tapioca, organic guar gum, organic inulin (sunchoke), organic vanilla flavor. This decriptions is informational only. Please review the actual product for ingredients and suggested serving prior to use.